Michele Della Valle was born in Rome and began designing costume jewellery at the age of 16. During a trip to Burma in 1976, della Valle purchased his first stone which he took to Christie's in Geneva. His meeting with the respected Hans Nadelhoffer (1940-1988), who was running Christie's Jewellery Department at the time, was a motivation factor contributing to the development of della Valle's career as a stone dealer and jewellery designer. In 1976 he worked for a year at Fürst Jewellers in Via Veneto, in Rome, which was then a representative of Harry Winston. In 1978, della Valle opened his own workshop in Rome's Piazza di Spagna and began travelling regularly to Asia in search of precious stones. This was the beginning of collaboration with Bulgari on special orders and his recognition as an important new designer by a clientele of film stars and opera singers throughout Italy. In 1987, he moved to Geneva to create a line of jewellery which now bears his name. Fabulously flamboyant, he loves to provoke the eye, using unusual mixtures of strong colours. 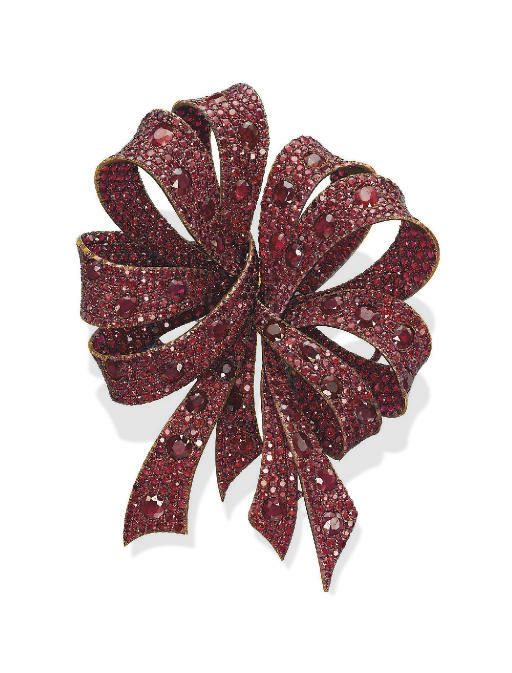 More recently, together with his partner Rossano Corsano, he has mastered the difficult skill of working with titanium, producing one-of-a-kind pieces as the large ruby 'bow' double-clip brooch in this sale (lot 292) or the whimsical 'wild strawberries' ear pendants. Thanks to the use of titanium, this impressive brooch is incredibly light for its size. The element titanium, being extremely light and strong, has the highest strength-to-weight ratio of any metal but, due to its physical qualities, is an exceptionally demanding material to work with and therefore better known for its high-technological applications in the aerospace, military and medical industries. The advent of titanium jewellery is a major development in the history of jewellery as it allows the designer to reach new levels of size and creativity.